HOW DOES THE PROTECT SURFACES TECHNOLOGY WORK? PROTECT protective shield is always active, day and night. Microban® provides round the clock protection against the growth of bacteria. Microban® technology functions in numerous ways to inhibit bacterial growth. Protein and enzyme activity is blocked and the organism DNA is damaged. The metal ions included in the Microban® additive are able to bind to many targets and stop important cellular functions. Key proteins, for example, are denatured and therefore prevent the bacteria from replicating on the surface. With the removal of essential survival proteins, the bacteria will be unable to reproduce causing the death of the organism. As Microban® antibacterial technology is incorporated into the tile surface during the manufacturing process; it continuously fights the growth of bacteria for the lifetime of the product. Unlike surface disinfectants which only have a limited residual activity, Microban® protection works continuously eliminating bacteria and keeping the tiled surface more hygienic between cleanings. Microban® antibacterial additives have a biocidal action which kills bacteria which colonize and grow on the ceramic tile surface – this action is only on the tiled surface; the antibacterial action does not create a sterilized environment. Sterilization is defined as a process where 100% of living microorganisms including bacterial spores are killed. For this to be maintained however the surface or product must be kept in a sterile environment in order to remain in that state. ongoing cycle of elimination that supports hygiene measures and helps prevent cross-contamination. Biofilms are a community of bacteria that live and thrive on surfaces. These communities can be damaging to the surfaces that they inhabit, such as ceramic tiles. They thrive in wet environments in the presence of nutrient contamination. Upon attachment to a surface and subsequent biofilm formation, these slimy structures can be very hard to clean and cause hygienic and aesthetic problems to the surface (such as discolouration or slime). Untreated tiles and Microban® treated tiles were examined for the ability to support E. coli biofilm build up by Scanning Electron Microscopy (SEM). A common biofilm test method, ASTM E 2647 was used for this investigation. Biofilm formation was allowed to develop for 48 hours and the samples were fixed and visualized by SEM for surface associated communities of bacteria. The PROTECT treated product remained free of micro-organism colonization, as only a minute number of cells were visible. The ability to stop adherence to the ceramic surface prevents the bacteria from beginning to form a biofilm and thus protects the surface. Detergents and disinfectants are a quick but short term solution which provides only a limited residual activity once the disinfected tile surface dries. Bacteria can then very quickly start to colonize the surface and grow and reproduce until the next time the surface is once again disinfected. Microban® antibacterial additives guarantee long lasting protection, continuously working to prevent the growth and proliferation of bacteria throughout the entire lifecycle of the treated tiles. The above graph depicts the level of bacterial contamination on the ‘Y’ axis and time on the ‘X’ axis. The level of bacterial contamination on the surface usually is specified as a CFU value (Colony Forming Units). The profile on the graph shows what happens when a surface is cleaned and disinfected with a liquid disinfectant. The surface of the product is not treated with Microban®. The level of bacterial contamination is rapidly reduced as can be seen at the point of disinfection (2 hours) and then slowly increases over the next hours to a high level. At this point (15 hours), the surface is disinfected again and the bacterial contamination rapidly reduced before slowly increasing as before. 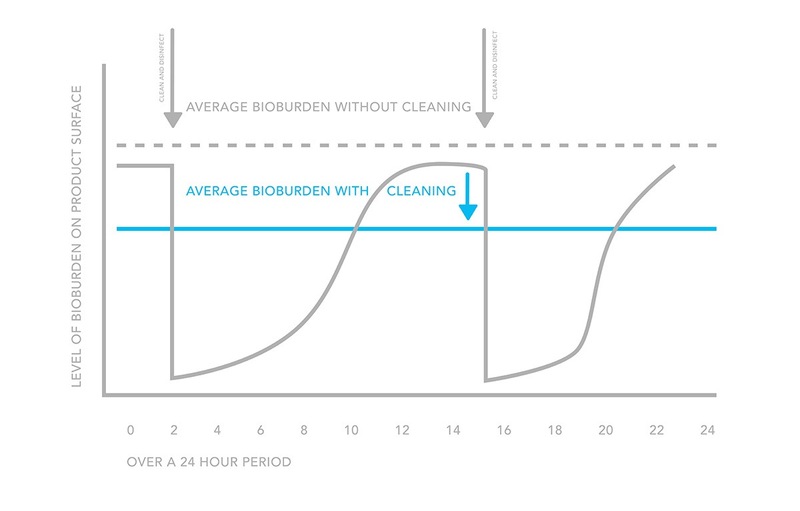 The dotted line represents the averaged value of the bacterial contamination over 24 hours WITHOUT any cleaning or disinfection. The solid blue line represents the averaged bacterial contamination value WITH cleaning and disinfection over a 24 hour period. 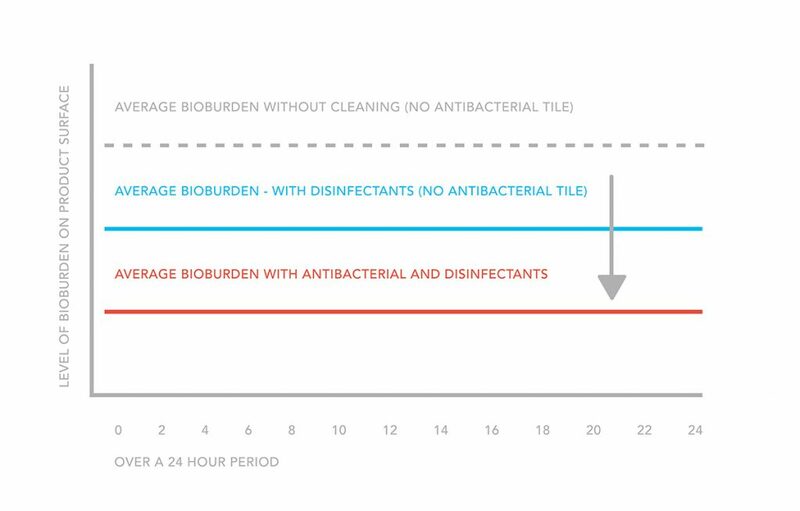 Integrated antibacterial technology does not replace cleaning practices, but rather complements existing routines and adds a level of protection between cleanings, 24 hours a day, for the lifetime of the product (solid green line). The PROTECT sample gives a lower level of contamination on the surface over a 24 hours period compared to non-treated samples, regardless o whether the untreated samples are cleaned and disinfected or not. Bacteria are invisible, but that doesn't mean they are not there! Thanks to PROTECT antimicrobial technology the growth of bacteria is significantly limited on floor and wall tiles, kitchen countertops, etc.